After a white-knuckle trip over a bridge from Portsmouth into Bristol, which involved lifting our bicycles over concrete barriers and construction equipment, the police officer who pulled us over told us something we had already figured out. What he could not tell me was a better way, other than taking a bus, to get to the East Bay Bike Path, a safe, multi-use paved trail that runs along Narragansett Bay from Bristol to Providence. It was second day of a four-day ride to explore by bicycle the southern New England portion of the East Coast Greenway, a planned 3,000-mile route of connected trails from Maine to Florida. More than a quarter-century into the project, long swaths are now on protected, safe trails. Others are not. There are 386 miles of Greenway planned in southern New England, and that section is about 41 percent complete, according to Lisa Watts, a spokeswoman for the East Coast Greenway Alliance. The rest is on everything from quiet back roads to very busy four-lane thoroughfares. “We always caution long-distance cyclists that this is a route in development,” Watts said. 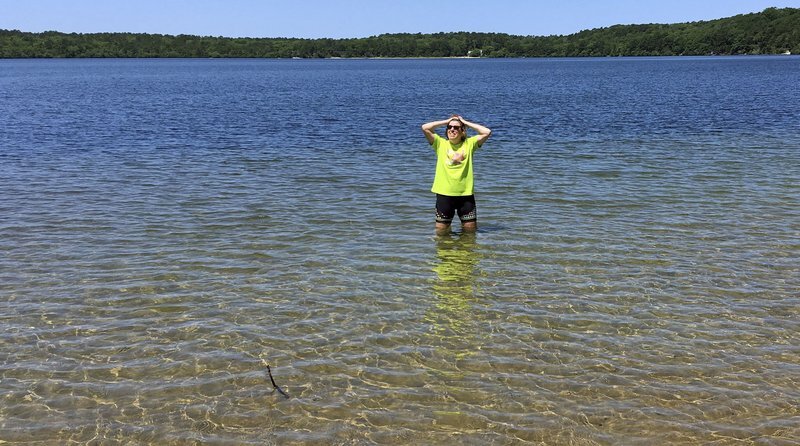 I rode with Lori Riley, of the Hartford Courant, 212 miles from Cape Cod to eastern Connecticut. 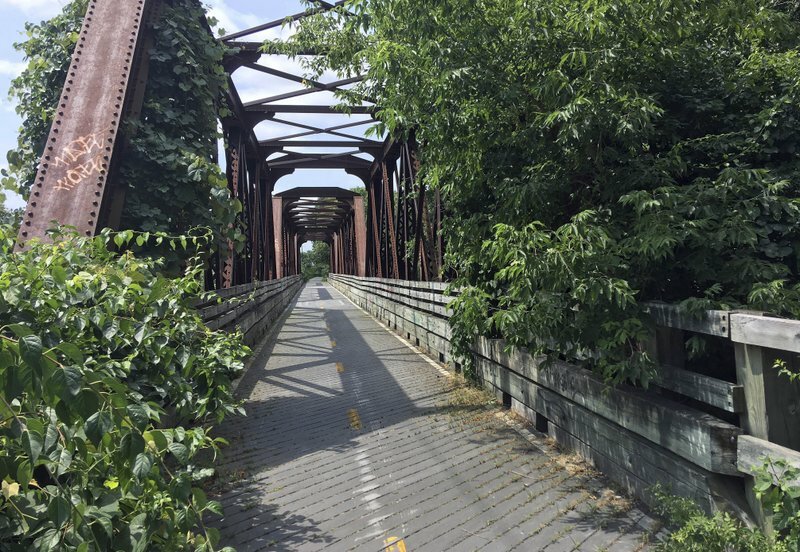 More than 96 miles of it was on rail trails and other bike paths featuring views of the water, old railroad bridges, ice cream shops, joggers and bicyclists. Our one flat tire came two miles from a bike shop that was adjacent to the path in Dennis, Massachusetts. In between the trails, the riding was often on heavily trafficked roads, such as the Old Kings Highway on Cape Cod, with no shoulder. That meant cars screaming by inches from us, honking, with people yelling, “Get off the road,” ″This isn’t the Tour de France” and worse. Leaving the Cape meant traveling the pedestrian walkway on the Bourne Bridge over the Cape Cod Canal, and then trying to negotiate Cape-bound Friday traffic on a heavily traveled rotary. Then came the searching. We used the mapping tool on the East Coast Greenway website to stay on course, but that’s hard to do while riding. Signs pointing the way were few and usually small and hard to spot. 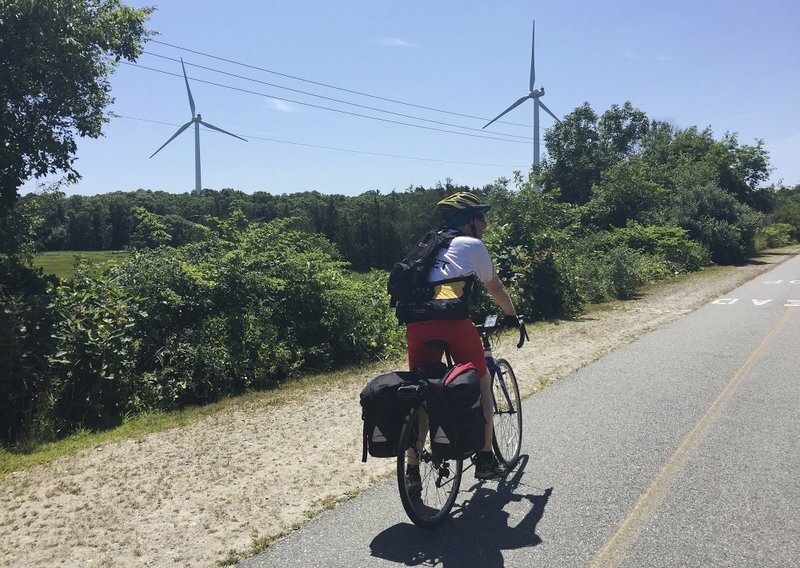 We passed salt marshes and windmills as we explored new bike paths on what is to become the 50-mile South Coast Bikeway system in Massachusetts. But the GPS then took us through the heart of New Bedford, Massachusetts. Confronted with a highway on-ramp at the end of a bridge, we were forced to walk the saddlebag-laden bikes down a long flight of stairs. That was followed by a teeth-jarring trip over downtown cobblestones and more traffic past a mall, before we figured out some back roads into Rhode Island. While some renovated bridges have bike lanes, on the Mount Hope bridge from Portsmouth we had to lift our bikes as we squeezed past equipment and construction barriers. The police officer, who did not ticket us, said someone called because they thought we were getting ready to jump. Once on the East Bay path, the stress disappeared with sunset views of Narragansett Bay. The next morning, a short ride downtown from where the East Bay path ends in Providence, we found the 19-mile Washington Secondary path, which runs through Cranston, Warwick and Coventry and ends a few miles short of the Connecticut border. Our fourth day took us home in Connecticut, mostly along the Air Line Trail from Pomfret, an unpaved stone-dust path that runs past East Hampton. It costs an average of $1 million per mile to build the Greenway and can take up to 20 years to complete a segment, but officials say it is worth the investment. 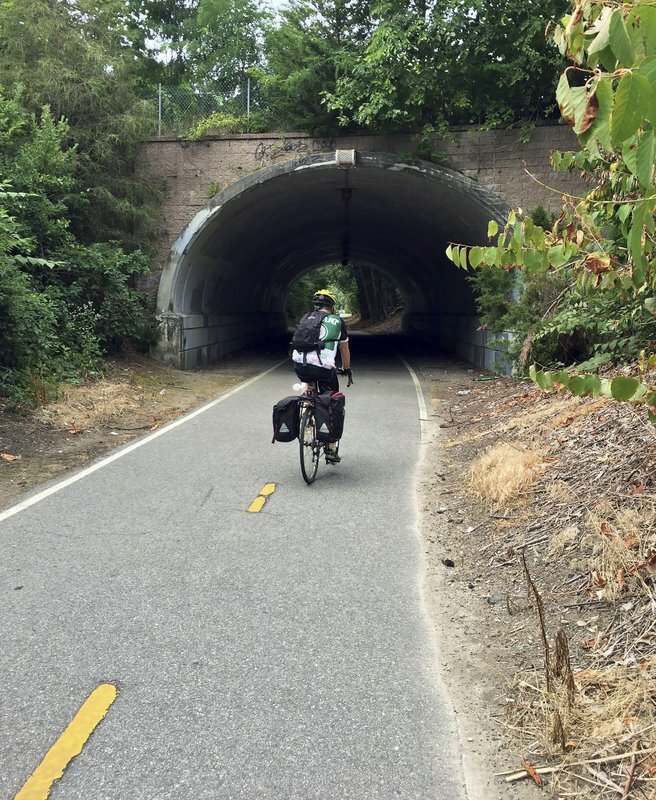 A recent study by the planning and design firm Alta in North Carolina showed the East Coast Greenway generates over $90 million in total benefits annually in the Raleigh-Durham-Chapel Hill triangle. In Connecticut, where 48 percent of the Greenway is done, several projects are have just been completed or are in the final stages, including key segments in Cheshire on the Farmington Canal trail and in Bolton, where two bridges connecting the Hop River to the Charter Oak trail are scheduled to open in September. Connecticut spends about $15 million a year on its rails-to-trails program, including $5 million in federal funds, said Thomas Maziarz, the chief of policy and planning for the state Department of Transportation.